(Cambridge) Criticized as saccharine on its initial release, It’s A Wonderful Life (1946) is probably one of the most watched Christmas movies of the era. In it, Jimmy Stuart stars as George Bailey, an unlucky small town businessman who gains a new lease on life when his guardian angel shows him how awfully the world would get on without him. Being so well known, it’s prime lampooning material. The premise has been parodied in multiple forms of media with as much consistency as Charles Dickens’ A Christmas Carol. Now ImprovBoston has decided to have a go. Much like the show I reviewed earlier this year, My Dark Love, in which Stephanie Meyer’s Twilight saga is the source of much scorn, the show demands audience participation. At the beginning of Merry Christmas, Mister Lampost!, an audience member is asked to volunteer. After a brief interview, Christine Cuddy, Claire Smithney, Emily Laverdiere, Marcelo Illarmo, Thomas Towell, and other cast members spend the rest of the show re-enacting his or her life out. It’s A Wonderful Life is used as a frame narrative. Plenty of jokes are made at the expense of the movie and its holiday-time corniness. The stories will of course vary each Friday. an oddball sort of way and surprisingly endearing. 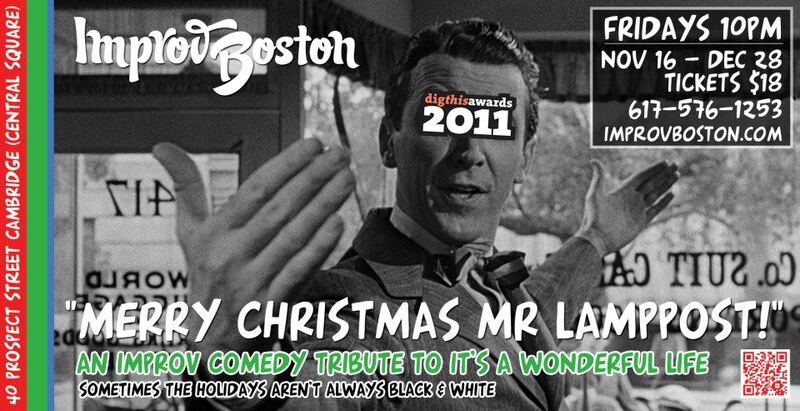 This entry was posted in Comedy, Other and tagged 2012, A Christmas Carol, Cambridge, Charles Dickens, Christine Cuddy, Christmas, Claire Smithney, December, Emily Laverdiere, ImprovBoston, It's A Wonderful Life, Jimmy Stuart, Marcelo Illarmo, Merry Christmas, Mister Lampost!, Thomas Towell by gilliandaniels. Bookmark the permalink.